One name that seemed to be everywhere in Paris was Victor Hugo. I know him as the guy who wrote Les Miserables (which I'll watch in London) but he seemed to be everywhere--restaurants, street names and many other places. I was beginning to think there must be many different Victor Hugos, one a chef, another a politician and another a playwright although now I've done some research, it's all the same person and he's a big French hero. We got smarter on Day 2. Rick Steves recommended taking the metro and getting a carnet ("car-ney") of 10 tickets at 11.60 euros (up from the 11.10 euros in Steve's book). That works out to 1.16 euros per ticket against 1.90 euros if you buy the ticket individually. The metro ticket is valid for 90 minutes after validation (note! You must validate by punching in or scanning the ticket or you'll be fined heavily if caught) and you can hop on the bus within that time although I don't recommend the bus because the traffic in Paris is very heavy. Paris' metro is easy to use, covers all places of interests and within 15 minutes walk of each. 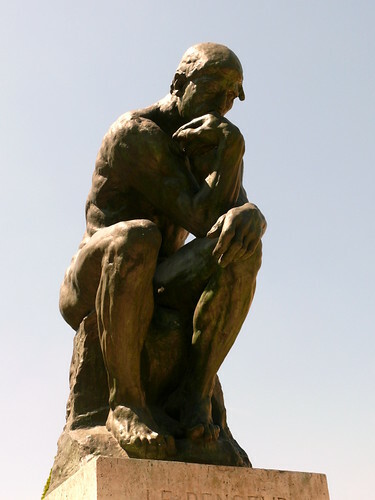 Paris' best kept museum secret is the Rodin Museum garden where you pay only 1 euro to walk and see Rodin's sculptures (who all had extremely big hands and feet) such as The Thinker (who I think was depressed rather than contemplative). If you insist, pay 6 euros to check out the museum studio where Rodin's smaller sculptures and The Kiss are kept. We saved the 12 euros (two of us) for lunch. 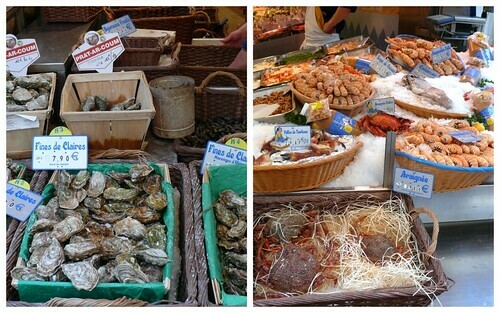 One of our favorite visits anywhere we go is the market and Europe's markets are a real treat. We decided on a smaller market so that we have time to cover other places. 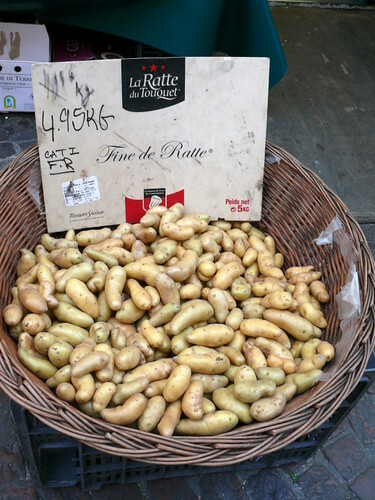 The market off rue de l' Arbalete (a few minutes from the Mouffetard metro stop--ask people) is just one street long but has everything--bakeries, charcuteries (French version of the Italian delis), fruits and veg stalls, restaurants, wine shops, cheese shops and many others. 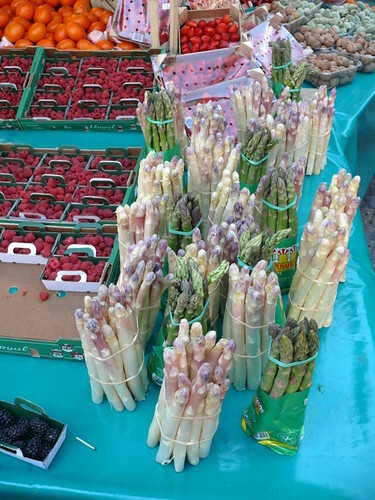 These white asparagus had purple tips like the ordinary green asparagus. Love asparagus. 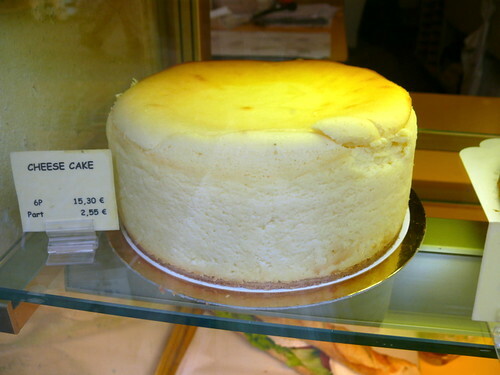 Never seen a cheesecake of this height. Wish I tasted it. 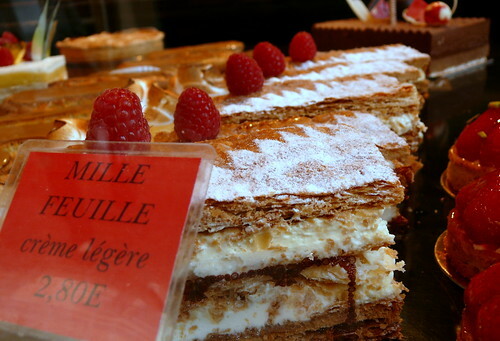 The mille feuille was half the price of those in Laduree but just as delicious although not as classy in presentation. 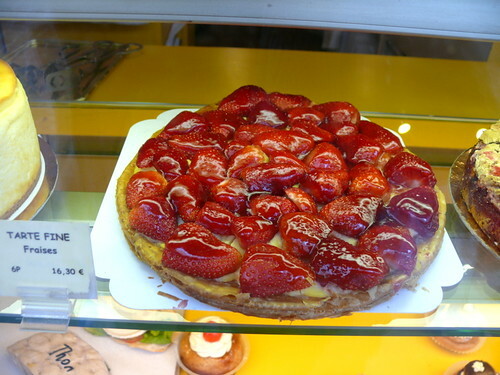 Seriously, if I live in Europe, I'll never bother to bake my own cakes or bread. At this seafood shop, I asked if they could shuck the oysters for us to eat on the spot and they happily obliged, suggesting that we take the 7.90 euros per doz because they taste just as good as the 12.90 ones I wanted. 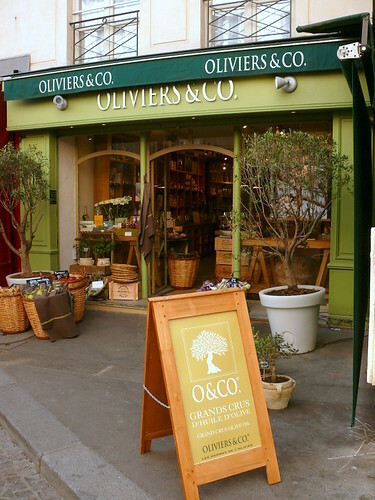 We had to step out of the shop and to the side of the street to eat, standing, so it was rather awkward but if we didn't do that, we wouldn't have tasted such heavenly oysters. I'll forever remember these oysters. They were the sweetest, freshest and deepest-flavored (I can't think of any other way to describe them; they weren't just the usual oyster flavor. You'll know when you eat them) succulent morsels I've ever ever eaten. I've had oysters in Victoria, Canada, San Diego, Australia, Hong Kong, China and Malaysia but none are as good as these French babies. This was one of the best meals we had and it was just an ordinary restaurant (Care TournBride Resto) on the market street. When I had the first sip of the onion soup, it was a food revelation. It was unlike the onion soups I've had back home where I suspect Campbell's beef consomme is used as the stock and the soup is thicker and very heavy. This soup was lighter in body and flavor yet had all the flavors of beef and onions and wine in perfect combination. 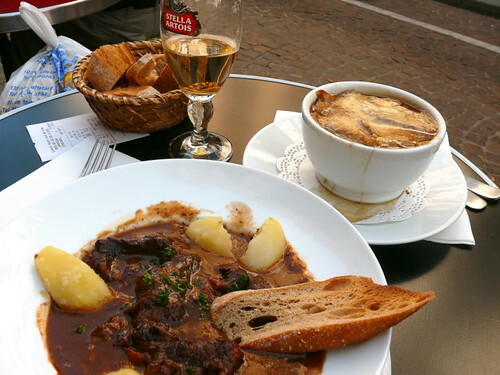 Hub was wolfing down fast on the boeuf bourguignon and no wonder because it was thick, tasty, full of flavor. It was the best beef bourguinon I've ever tasted. I highly recommend this place except I forgot to note the name of the restaurant! 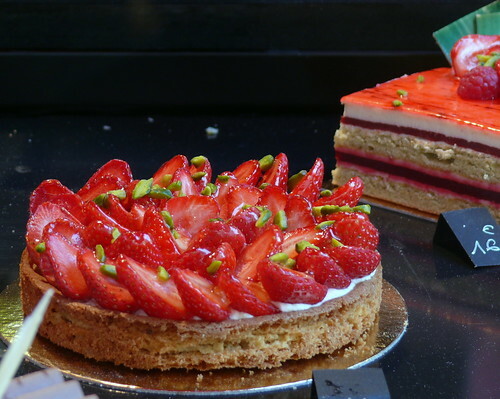 At this point we were thinking Paris really is food heaven. This guy esmerized the crowd with his moves. 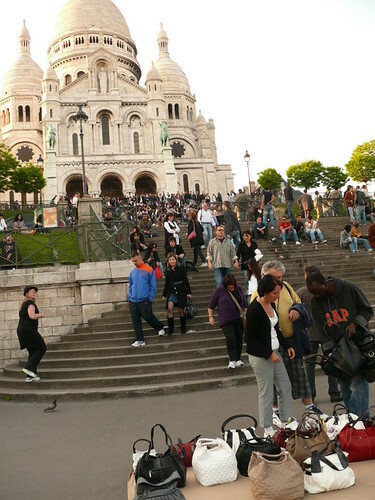 Sacre Coeur Basilica in Montmatre is a church on the highest point of Paris. 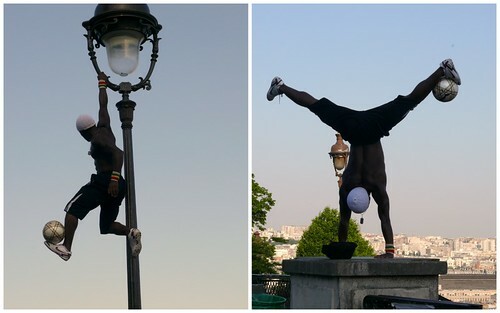 You can get a good view of Paris there. When we got there, a couple of Africans approached us with colored strings in their hands. I read about that 'friendship bracelet' trick and refused to stop. We sat down on a low wall and watched as they approached a young couple, separating them. They chatted as they worked, putting the strings on their fingers telling them that it's just a demonstration. Very soon, a bracelet is wound tight on each of them and they were told to pay 7 euros each. So remember that, do not let them tie or try anything on you. Don't stop for the gypsy who asks if you speak English or gives you a gold ring either. We just walked on. Paris is very annoying with all these peddlars. The front of the church was like a bazaar with buskers, people selling fake designer bags (so it's not true that you can't use a fake designer bag in europe; it's everywhere), people people-watching, dancing, drinking beer and doing everything but go to church. There's no entrance charge into all churches in Europe except for Westminster Abbey but Hub noted that it's free on Sundays. Sacre is a beautiful church inside with the usual stained glass and statues. 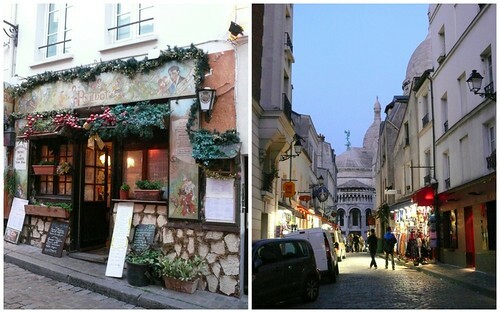 From there, we went next door (you can access on the right of the church; no need to go down 200 steps or take the funicular/cable car) to place du Tertre, the famous area on the hill where struggling artists such Picasso used to live. 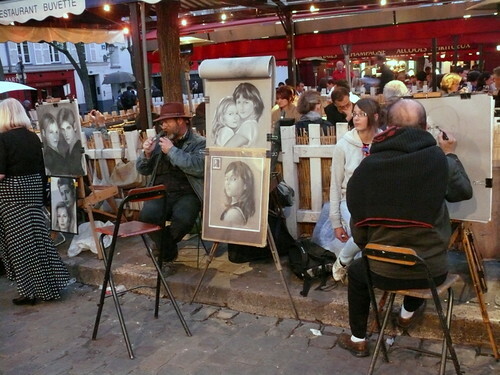 You can get your portrait drawn or walk around with the hundreds of tourists, checking out the restaurants and the souveneirs shops. Very touristy and a bit fake for me. Contrary to what people tell me about their brushes with rude French waiters, I found them very friendly and helpful and most of them will speak English if they can. Times have changed. He had salad, I had soup. 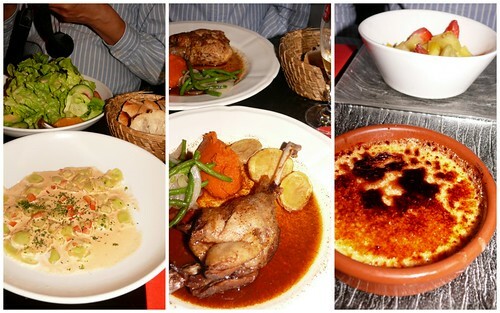 He had chicken, I had 'canard' and both came out looking the same and tasting nearly the same. 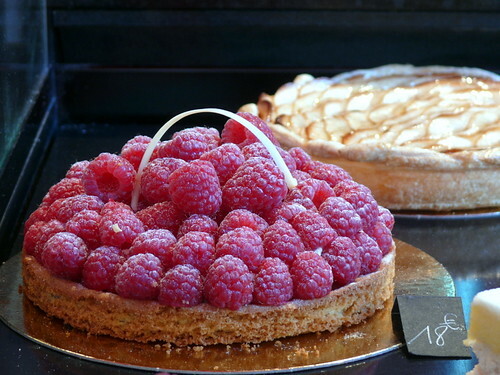 He had mixed fruits and I had a creme brulee that was so sweet that I couldn't eat it. 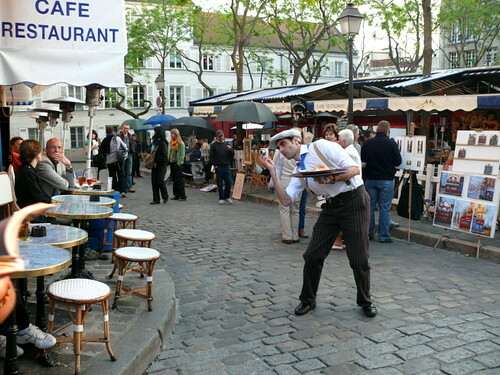 We had dinner in place du Tertre. We were mislead by the price on the black board (I love menu blackboards), 12.90 euros per pax for appetizer, main and dessert but when we sat down, we were told that it was 18.90 euros per pax because it was past 6 pm. Note that, and save yourself 6 euros on the same thing by eating before 6 pm. Normally I'm a snob and avoid set menu but when on a month-long tour, we needed to be on a budget. 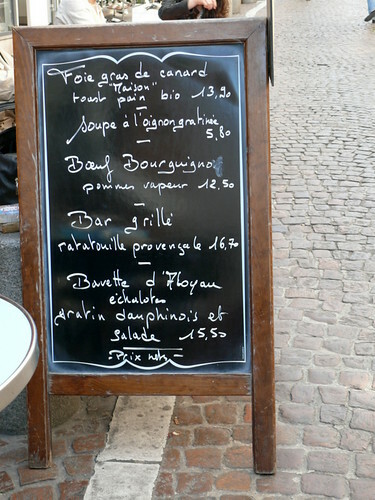 We found that the plat du jour (plate of the day) are great deals. It's just the dish of the day at a lower price. Dinner at Le Deli (I should've known by the name) was so mediocre that we doubted our earlier impression of 'all food in France must be good'.It kind of spoilt the night. But as we walked down the hill, we saw people snapping away. It was Eiffel Tower sparkling and blinking. It was 11 pm, the same time we saw the lights show the night before. Just lots of lights blinking but it was thrilling to see. We saw this place after we had dinner. What a bummer because it was recommended in Lonely Planet. Wanting to squeeze in as much as we could, we took the metro to Pigalle (one stop) where Moulin Rouge is. 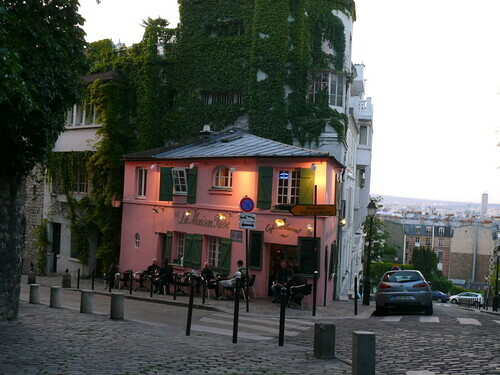 Pigalle turned out to be the red light district of Paris but very tame compared to Amsterdam's. When I saw Moulin Rouge, I was sure it was the sleazy version and not the original cabaret club. The whole area seemed so dead so we left. 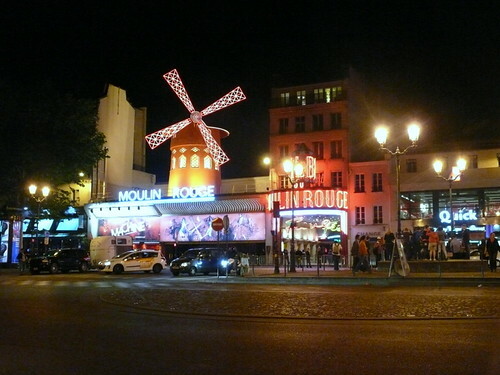 We found out later that it was the real Moulin Rouge with a windmill as its distinct feature. Sounds like you are having a wonderful time. The food pics are excellent. 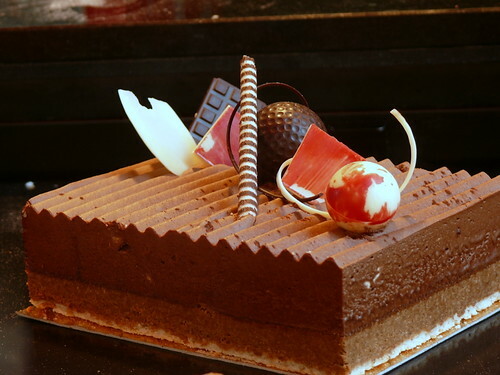 Any other blog (not foodie) we would just see the sites. Thanks for a different perspective. Oh lovely oyster babies.!!!!*scream* ! :-) Love your post! 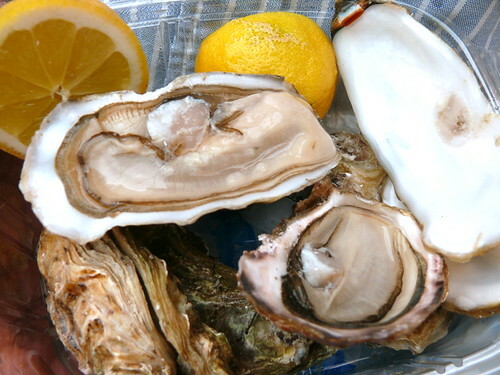 thats honest of them, to recommend you the cheaper option..ohh miss good australian oysters. I'm enjoying reading about your Europe trip - very nice pics & tips :-) I think i'd go crazy in Keukenhoff & bust my camera memory capacity - that's like my dream place! 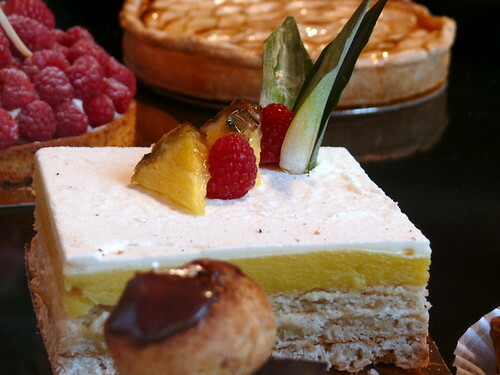 All those wonderful photos of food and all I can think about is, OMG, You're going to see Les Miserables! I am a HUGE fan of live theater and have seen countless musicals and plays, but not Les Miserables and I can't wait to hear about it! I'm so glad you are having a great time! i can not say it enough, GREAT FOOD PICS! it all looks great. i know how long it takes to format pics and post a blog and i just want to thank you for your time and effort so that we can all tag along with you as you tour around. it really is an incredible feat to achieve considering how much time you are on the road. your perspective is right up my alley, too. The food pictures are excellent! You made me think that the best way to know these little treasures inside the city of love you need to be guided by local experts. You wrote: "There's no entrance charge into all churches in Europe except for Westminster Abbey but Hub noted that it's free on Sundays." I'm afraid this is inaccurate. MANY British cathedrals/churches charge for admission. It's 12.50 to get into St Paul's Cathedral for example. This is because British churches do not get any financial support from national government. The situation is different in most continental European countries because churches there get money from the government. But some still charge for visiting parts of the church, e.g. the cathedral in Toledo, Spain. BTW even in British churches that charge for admission, you never need to pay if you are coming for a service (on any day of the week, not just Sunday). b: what i meant was 'continental europe' where churches are open to all, free except for some parts like the dome or the towers.